Hair begone: Electrolysis is the best way to remove unwanted hair. ONE good reason to choose electrolysis over other hair removal methods such as tweezing, Shaving or waxing is the fact that the hair is permanently gone! Electrolysis (or more accurately short wave diathermy) is described as the only permanent method of hair removal. Other do-it-yourself methods like shaving, waxing, tweezing and threading are common but not necessarily effective. In many cases, these methods actually aggravate the problem of unwanted hair. What happens in electrolysis is that a tiny surgical probe is inserted into each hair follicle and a split second of impulse energy is directed down to the hair root. The hair is then lifted (not pulled out) and these steps are then repeated until the desired area is cleared. 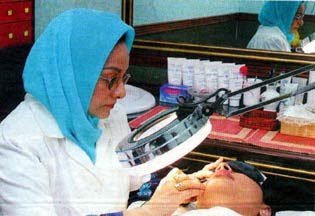 With 38 years of experience, London trained beautifian, Charijah Dato' Shariff or better known as Rani from Renie Beauty, is the pioneer for this treatment in Malaysia. Her daughter, Anita Farhana, a Master's Degree holder, has also joined Rani as a qualified Electrologist. Both ladies are electrolysis experts will make you feel at ease with these treatments. Renie Beauty now does combination treatment of Intense Pulse Light and Electrolysis for clients. She encourages those interested in electrolysis to visit her outlet for a more accurate estimate as to the number of hours of treatment a person may require. Apart from electrolysis, Renie Beauty also provides Photo Rejuvenation treatment which is another service that has given great satisfaction to all her clients.